Book Review: What’s Happening in Europe? A miracle abortion strategy that has accomplished what? America is the hope of the world? In God’s Continent, Philip Jenkins examines the developments and changes occurring in the religious landscape of the European continent. The author has emerged as a key voice in the study of the growth of the church in non-Western settings. It could be argued that Jenkins has done more than any other American academic to bring into the mainstream of American thought, the reality of a changing global Christianity. Jenkins’ award-winning and highly-acclaimed work The Next Christendom serves as the most recognizable and broadly-received statement to the church of the reality of the changing face of Christianity. Philip Jenkins currently serves as the Edwin Erle Sparks Professor of the Humanities at Penn State University and works in both the History and Religious Studies departments. Jenkins has dozens of books to his credit, many on the topic of global Christianity. In God’s Continent Jenkins directs his attention towards the current state of religion in Europe. 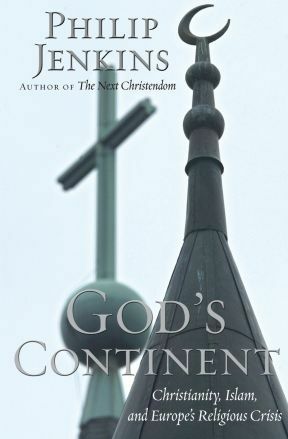 While the story of European Christianity has been well documented in church history books, God’s Continent explores the more recent developments in European religion. Jenkins offers an alternative narrative to the dominant assumption that Islam is ascending in the context of an overly secularized, post-Christian Europe. The assertion that “Europe is acquiring much greater ethnic and cultural diversity is certain, but [for Jenkins] the religious implications are less clear” (14). “The core issue, then, is less the ethnic character of a future Europe than is religious tone, and that question remains very open” (19). Jenkins explores three different threads to develop his examination of European religion. First, Jenkins examines the changes in European Christianity and challenges the assumption that the European continent has lost its Christian presence and has slipped into a deep and entrenched anti-religious secularism. Second, Jenkins focuses on the development of Islam in Europe and reveals a more complex picture of the presence of Muslims in Europe. Finally, Jenkins projects the future of religion in Europe and provides a more nuanced trajectory for European religion. Similar to Jenkins’ previous works on global Christianity, God’s Continent contains statistical analysis (usually showing the numerical trends of decline and ascension in different areas of the world) and a future projection of potential conflict between emerging faiths (typically between Christianity and Islam). God’s Continent follows that pattern by tracing the changing demographics and statistics of European religion. Jenkins points to the decline of Christianity as evidenced by the declining number of baptisms and the plunging number of seminarians, while simultaneously emphasizing the rise of Islam. Contrary to his previous works, Jenkins presents a more nuanced argument regarding the complex nature of European religion. While acknowledging the numerical decline of Christianity in Europe, Jenkins asserts that this decline is not a simplistic phenomenon. “In western Europe too, some incidents suggest that Christianity is less moribund than the formal statistics might suggest” (58). The sustaining of religion in Europe may surprise some because it runs against a simplistic application of secularization theory. “Contrary to widespread assumptions, then, rising Islam will not be expanding into an ideological or religious vacuum” (54). Christianity in Europe has been subject to simplistic analysis and depicted as succumbing to a triumphant wave of secularism. While there has been a notable decline of church participation, Jenkins notes that “falling levels of observance and church attendance cannot simply be equated with pure secularism, suggesting instead that people are ‘believing without belonging’” (64). Furthermore, the decline of Christianity in Europe could spur on new expressions of Christianity that may contain greater vibrancy. “In a minority setting, Christianity can restructure itself to serve the needs of a new society, demanding more commitment and involvement in some areas of life while acknowledging greater flexibility in others” (56). Jenkins sees life in European Christianity by pointing towards the resurgence and revivalism among established Christians like the Anglicans, the growing strength of the Evangelical Alliance, and the growth of immigrant churches among Africans, Asians, and Latin Americans. The strength of this contribution rests on Jenkins’ more nuanced argument regarding European Christianity. Jenkins presents a more layered perspective by presenting the resilience of Christianity in Europe. Jenkins believes not only in the survival of Christianity in Europe, but the potential resurgence of Christianity. Jenkins’ analysis, therefore, does not rely upon the heightening of conflict between Christianity and Islam. The weakness of this contribution hinges on Jenkins’ reversion to the confrontational language employed in his previous works. While acknowledging a more nuanced reality, Jenkins still employs potentially inflammatory language. His use of terms like “conflict” (when addressing the relationship between Christianity and Islam), “clashing values,” and “tension” does not offer a conciliatory posture. As one of the more recognizable voices in the burgeoning story of world Christianity, Jenkins’ work on European Christianity should serve to sharpen our dialogue on the changing religious landscape of Europe. The hope is that this dialogue would not deteriorate into confrontational language. An ongoing key contribution of Jenkins could be the presentation of a religious reality that gestures towards a potential reconciliation between the different strains of religion that are emerging in Europe and throughout the rest of the world.